From June to August an armed conflict raged in the northern area of Palimbang, Sultan Kudarat, Mindanao. PASALI staff sought partnerships with local medical clinics, networks, non-profit organizations as well as government bodies, such as DSWD, while PASALI Netherlands sought in partnership with the Dutch Consortium of Migrant Organizations (DCMO) and Islamic Relief Nederland for means to deliver relief goods and medical attention to the 1927 families affected by the conflict. 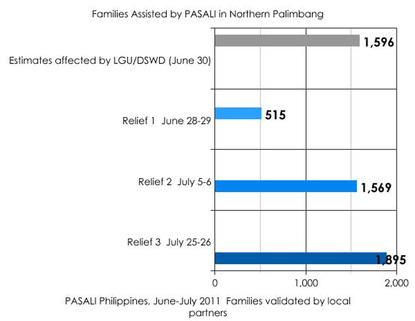 PASALI delivered relief assistance in three batches: June 28-29, July 4-5, July 25-26. PASALI collected basic data from each family that it gave assistance to. Prior to any distribution, PASALI dispatched advance teams to validate with local partners the recorded families and to distribute colored cards that families presented to the team with the relief goods. In August, the armed troops finally left the north, and families began slowly returning to their homes. PASALI Philippines with PASALI Netherlands is looking to find ways to include this area in the projects, to contribute to the recovery of the communities. Of the 1927 families PASALI recorded, PASALI reached 1895 families or an estimated 11370 men, women, children and elderly last July 25-26, 2011. 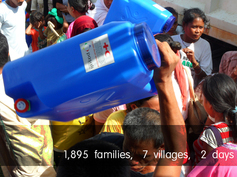 Aiming for quick recovery, PASALI distributed the identified most needed nonfood items such as kettle, water jugs, plates, spoons, forks and cups to 1,438 families directly to families in 7 most affected villages. During the second day of relief distribution, armed fighting in Kiponget took place, again, most of the resident left their home again. Hence, the distribution was made a week after the armed skirmishes halted. The road networks are rough with rains and flooded rivers which the staff and members of the distribution team encountered. The distribution team usually went home late at seven evening. Despite these, the staff and the rest of the distributing team were happy for they contributed in serving the needy people that suffered from conflict. Photos of Doctor Kagape and his team holding clinic June 29.
the partners who made these efforts possible. Migrants’ initiative transforms community through technology and Tri-people empowerment.